When Germany announced that it was effectively turning its back on nuclear power by mothballing all of its reactors by 2022, there were more than a few surprised faces and some awkward questions. How exactly did the country think it was going to meet its energy needs? Surely it would have to import considerable amounts from neighbouring France, thereby subscribing to nuclear by proxy. The answer was perhaps even more surprising. On 1 January this year, the German parliament enshrined into law an act requiring that by 2020 35 per cent of all of its energy needs must be provided by renewable sources, followed by 50 per cent by 2030 and 80 per cent by 2050 — far more ambitious in scope and magnitude than the European Union’s target of 20 per cent by 2020. Germany was already making good progress in the sector, particularly with offshore wind and geothermal energy. There are currently eight operational offshore wind farms, generating around 200MW. To meet the first set of 2020 targets, though, calls for upwards of 10GW. Clearly there needs to be a complete step-change in production; a few parks going up here and there every decade or so simply won’t cut it. Europe’s largest construction company, the Austro-German group Strabag, started dabbling in the offshore wind business around 10 years ago, focusing on its existing strengths of production, transport and installation. It also began experimenting with new designs for base foundations, believing that this was a key limiting factor the overall production chain in offshore wind. Essentially there are around four main types of wind turbine foundations in use. 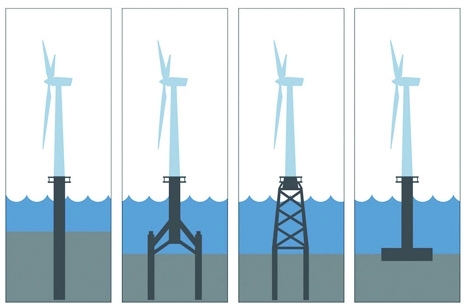 When turbines took their first tentative steps from land into the shallow waters just off the coast, they generally employed monopile foundations — a simple design in which the wind tower is supported by a steel pipe, either directly or through a transition piece. Depending on the subsurface conditions, the pile is typically driven into the seabed by either large impact or vibratory hammers, or the piles are grounded into the sockets drilled into rock. They are reasonably cost effective but not suited to water depths of more than 15m and they struggle to hold turbines greater than 2-3MW. To handle some of the latest generation of 5-10MW wind turbines, moored in greater water depths many miles off the shore, requires a bit more support. Jacket foundations consist of a frame construction similar to an electricity pylon. It is technology essentially borrowed straight from the oil industry. 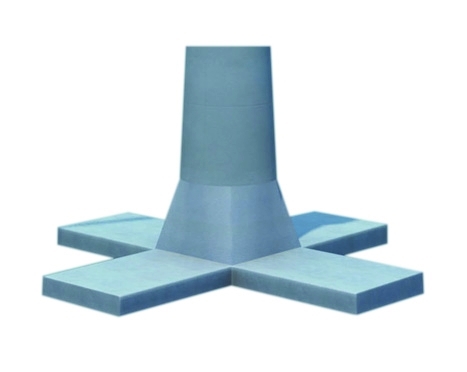 The tripile foundation, meanwhile, is a design developed specifically for offshore wind. It consists of a steel pile that sits above the water level on a three-legged structure that has to be pinned to the seabed. Tripiles can be used in water depths between 25m and 50m. However, all of these methods require some degree of construction at sea with associated costs and environmental impact. There is evidence that drilling and driving turbine foundations into the seabed creates acoustic emissions that cause distress to local mammal populations. It has become a real obstacle for planning, further protracting the whole development cycle and keeping those looming renewable targets out of reach. But what if you could build the whole turbine on shore, put a big heavy ballast weight on the bottom, float it out on a ship to where it needs to be and plop it in the ocean so it sinks firmly in place? This is the basic, if rather oversimplified, vision of gravity-base foundations. While the idea has been around for some time, Strabag is arguably the first company to put real faith in it with big-figure investments. Its gravity-base design consists of a cruciform pre-stressed concrete box girder base measuring 40 x 40m with a height of 8m. At each end of the box girders are single bearing pads, each with an area of approximately 100m’, which transfer the loads to the subsoil. On this base is a shaft that tapers up to the boat access ladders and platform at a total height of 65m. This is then topped with the turbine. To increase the dead weight of the base, the box girders and concrete shaft are filled with sand after installation. ‘We are convinced that it is a more economic and ecological version,’ said Gerald Zangl, managing director of Strabag’s Offshore Wind division. 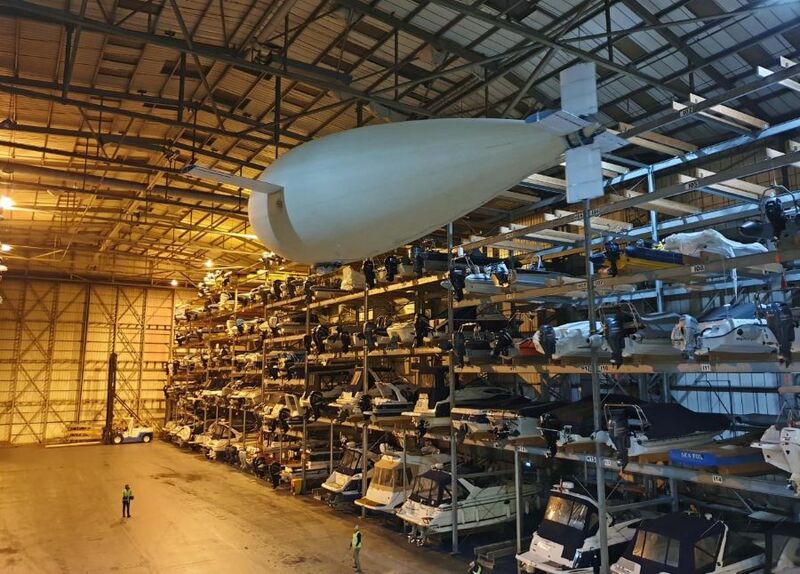 The Strabag vision is for a coastal terminal where parts are delivered for wind turbines (some may also be manufactured on site), assembled and put on board a semi-submersible vessel that travels out to the site of the proposed wind farm. A second vessel, moored semi-permanently off the shore, then prepares the seabed ground and the turbine is lowered down at the precise site. Strabag is now building such a terminal at a cost of around €500m (£408m) — with around €113m of public funding — at a site on the German North Sea coast at Cuxhaven. According to the company, it will be ready for full production by late 2013 and the first pilot project will be a 10-turbine wind park named Albatross 1. With such large capital at stake, the company had to be sure that its vision was rooted in sound engineering principles. A single gravity-base-founded wind turbine was tested in 2006 in the Baltic Sea. But this was in firm, rocky seabed soil requiring no ground preparation at all. The German North Sea, where the majority of the potential generating real estate lies, presents more of a challenge, with fine-grained sand left over by glacial retreat. So the company built an €8m full-scale model of the gravity-base foundation essentially on the beach at Cuxhaven to match the soil conditions further out in the North Sea (see box). ‘It’s the German way — we have to be sure to 99.9 per cent before we build it off shore,’ said Dr Udo Hartwig, the engineer responsible for testing. Three million test cycles and several terabytes of gathered data later, the engineers were confident the foundation would remain rooted in stormy conditions. The company is now working on the carrier vessels that will transport the turbines. While borrowing basic principles from oil-rig platforms, it will need to move at some pace to complete wind parks in the projected time. Strabag has commissioned Voith to build five radial propellers for each carrier: four of the 8-tonne, 5.6MW propellers will be installed at each corner of the ship and another one will be kept as a replacement unit. The carrier will be able to travel at 10 knots in waves of up to 2.5m and a wind force rating of 6-7. It will therefore provide 270 operational days per year. 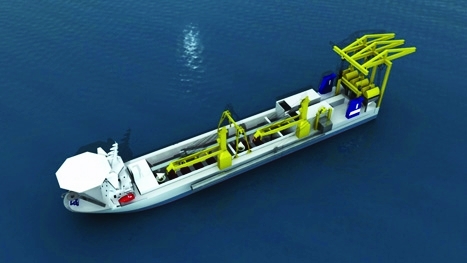 It will be accompanied by a ground preparation vessel equipped with crane grab and suction dredger. ‘The concept is to excavate sand off the seabed onto the vessel, which is capable of holding around 20,000-25,000 tonnes of dredged material, and then that dredged material is put back into the foundations. In the ideal situation, we go down between 3m and 5m deep &#8212; and what we take out, we put back in the base,’ said Foyle. Still, offshore foundations can be affected by ocean currents causing subsoil to be washed out from under the foundation, creating so-called ‘scours’. Strabag has developed a special mesh layer to circumvent this. In March, the German Federal Maritime and Hydrographic Agency (BSH) for the first time approved the use of concrete gravity foundations in deep waters instead of steel, based on Strabag’s detailed assessments and proposals. It effectively gave the green light to the Albatross 1 farm, which will feature 10 5MW turbines made by XEMC Darwind, the Dutch turbine-making unit of China-based Xiangtan Electric Manufacturing. But this is the first small baby step compared what is planned and indeed what is required make the whole plan economically viable. ‘We do need constant development; single wind parks are not suited to serial systems,’ said Zagl, adding that once the Cuxhaven facility is up and running it could exploit a large swathe of the German North Sea. But what about the patch of the North Sea further east? According to Foyle, who heads up Strabag’s British and Irish operations, there are plans at a ‘very advanced stage’ for a serial offshore production capability similar to the one under way at Cuxhaven in the UK. The one brake on all of this, in both Germany and the UK, is the development of suitable grid infrastructure that can handle peaky loads and the laying of subsea cable networks. Even in Germany there is a lot of catching up to be done. Small-scale models of gravity-base wind turbine foundations have been tested previously at German universities. The problem is that, while smaller versions of structures reproduce mechanical behaviour of the real thing quite well, you can’t scale down grains of sand accordingly. And this is absolutely crucial to determining how the soil will behave with 8,000 tonnes on it. So Strabag built a full, 1:1-scale test facility. It cleared an area of sand 50 x 50 and 7m in depth, put in its bespoke foundation base and filled it with water. The structure didn’t contain the full turbine with blades but was still 30m high. 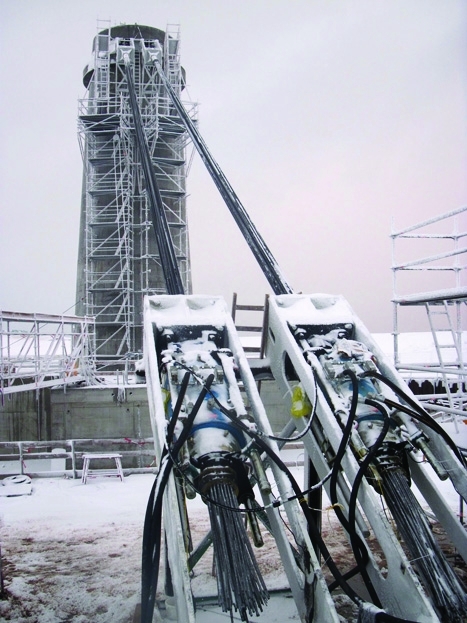 To simulate the dynamic loads of wind and waves, the company attached cables and hydraulic jacks of the sort it normally uses to hoist parts of skyscraper aloft where cranes are too short. ‘Normally these jacks were used for very low-velocity, very heavy loads, pulled very slowly. Here we have to simulate originalperiods of the wave, which are in the range of five to 20 seconds. We have to change the loads from zero to 1,000 tonnes, then release the load in 10 seconds to zero back,’ said chief engineer Dr Udo Hartwig. An array of sensors was placed in the soil during hydraulic loading to look out for liquefaction and foundation sinking (the same effect that occurs during some earthquakes). The engineers found that there was very slight inclination of the foundation under maximum peak wave loads. When this happened, one of the foundation plates was loaded more than the others, leading to an increase in stiffness of the soil beneath the foundation plate. However, when the velocity of the inclination slowed down when the wave had passed, the sediment on the opposite side was looser and softer, and so by sheer weight of the gravity foundation this side fell, and the inclination was reversed and self-corrected. 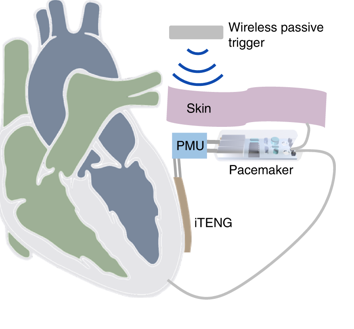 I feel I missed out a bit – I took out a patent on a system which would enable this, but gave it up when everyone seemed happy with the monopile. I was also advocating standard design but was told that every turbine must be tailored to the specific site. But Strabag have the right approach. We have to stop doing wind farms project by project and deploy 1 or 2 5MW wind farms per day, 9 months per year, for the foreseeable future. can be towed out and placed with no sea bed preparation. Why do it? Offshore wind power is horribly expensive and requires huge subsidies. In spite of what everyone says, quite often, there are calm periods when the system load is at its maximum. Because wind is changing all the time, thermal stations need to be kept on standby and, as a result, there is only a small reduction in carbon dioxide. A much greater reduction in carbon dioxide at much less cost would be achieved by cleaning coal using hydrogen fluoride or by exploiting what seems to be huge shale gas resources. But underlying all of this is the fact that the lack of significant warming over the last 15 years proves that carbon dioxide does not cause dangerous man-made global warming. So the whole renewable energy mania is a nonsense. 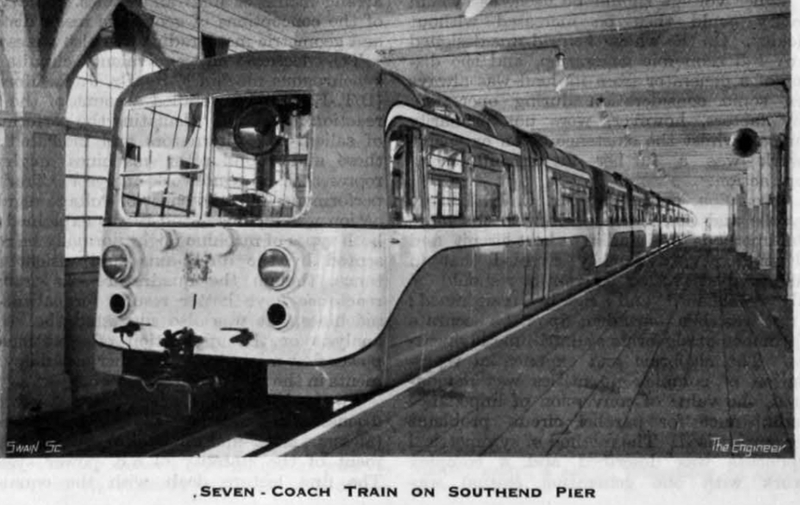 I am concerned that not enough information is being published about the ongoing maintenance for these beasts. What are the expected life-times for the moving parts – it’s not just a simple job of replacing a bearing. If maintenance costs have been underestimated or ignored by vested interest then the viability of the whole technology is even more questionable. The earth is not flat. Climate change is happening. If you dont like that then just as serious if not more is ocean acidification. Thats not caused by anything other than carbon dioxide. That is undeniable. Gravity based structures are huge and expensive suction piles reduce the weight hugely and are precisely alignable. The remaining whales in the sea will not be disturbed by the water being sucked out of them. I’m curious to know what, if anything, is done to counteract scour. Being that the sea bed in the North sea is sand, what is there to stop the thing from simply toppling over once the sand around/under the base is compromised?